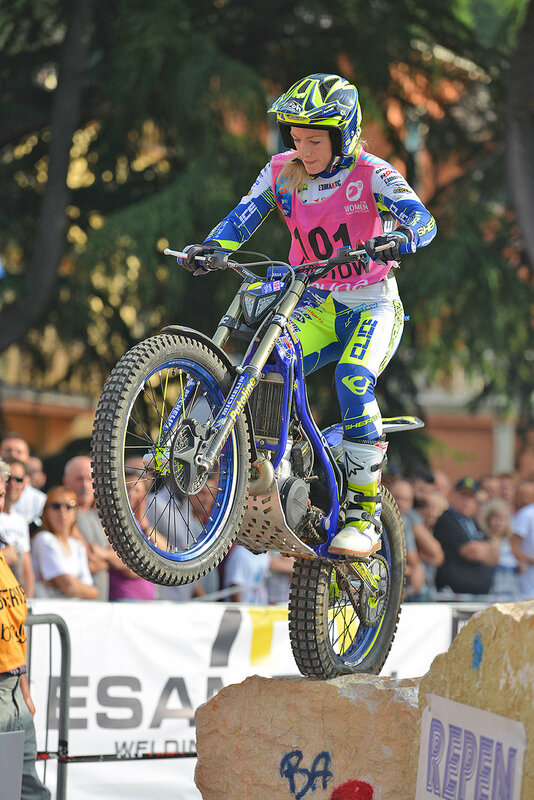 Emma Bristow's reign as the Queen of Trial will last for at least another year after the 27-year-old completed an unbeaten season in the FIM Women’s Trial World Championship. With the feet-up females competing over a shorter four-round championship across three venues, Bristow (Sherco) won all four Trials to finish the season with a 22-point advantage over Berta Abellan (Vertigo). With the opening event at Motegi in Japan making up two rounds of the championship, Bristow went toe-to-toe with her Spanish rival Sandra Gomez (Gas Gas) on the opening lap of the opening Trial as they gapped the field by a big margin to go into lap two on five marks each. On the second lap the British rider, showed her class to add just two to her total as Gomez crumbled under the pressure and dropped a further fifteen. A score of sixteen on the second day was less than half that of second-placed Maria Giro (Montesa) and with Gomez down in seventh place, the tone for the season was set. Gomez was back on the podium at the Alpine ski resort of Auron in France but conceded second place to Neus Murcia (Beta) by a single mark, meaning Bristow’s victory effectively left her needing just a finish in the decisive final round at her home GP in Silsden, Great Britain. However, Bristow made sure she signed off in style in front of a huge crowd on the hills of Addingham Moorside, trading cleans with Ingveig Hakonsen (TRRS) through the first five sections and posting a first lap of seven, before controlling the second lap to win by nineteen marks over the Norwegian. Meanwhile, Abellan came home third to secure second position in the championship ahead Gomez. 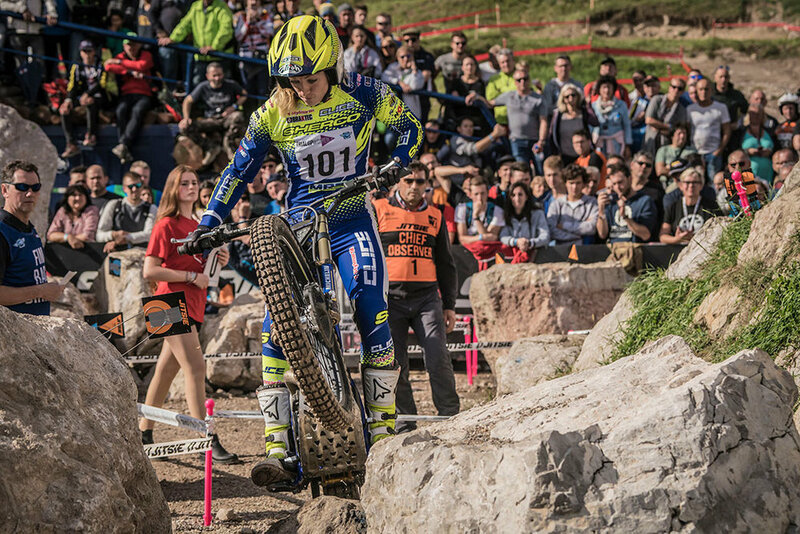 Emma Bristow (Sherco) saw her stunning 100% win record, which stretched back to May 2015, finally come to an end in the final round of the 2017 FIM Women's Trial World Championship but even that wasn't enough to stop her from claiming an impressive fourth straight title. After virtually faultless rides in the previous three rounds of the season – two in the USA and one in the Czech Republic – Bristow arrived to the final round at Arco di Trento in Italy with a thirteen-point lead over Spain's Sandra Gomez (Gas Gas). With Gomez holding a ten-point cushion over Theresa Bauml (Beta) from Germany, the top three positions looked secure before the action got underway in Italy, but Bauml had other ideas, finishing just a single mark behind the rampant Bristow on the opening lap. A maximum on section two of the second lap put Bristow almost immediately on the back foot and following a three just two sections later she was left watching helplessly as the German matched her clean for clean to take a memorable win by four marks. However, second place was still easily good enough for the British star to take her fourth consecutive FIM World crown by a healthy fifteen-point margin, whilst Gomez ended the day two marks behind Bristow in third to hang on to the runner-up spot in the championship ahead of the impressive Bauml. 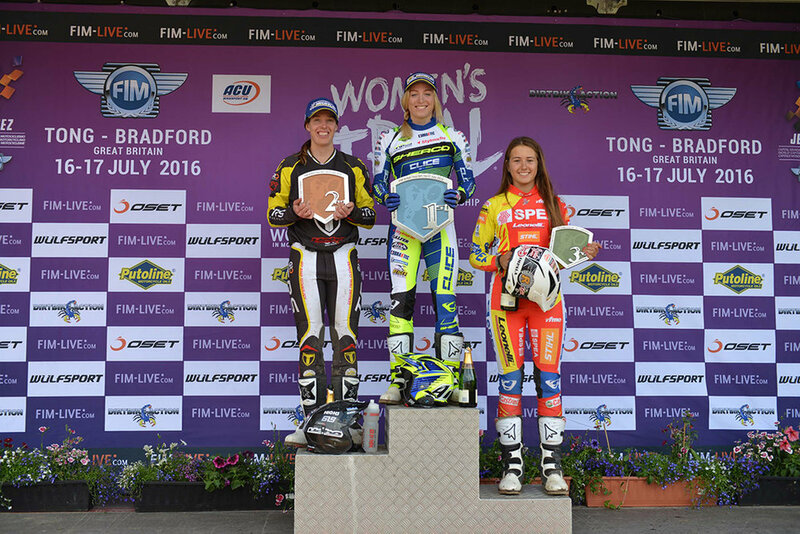 Emma Bristow - Sherco romped to her third consecutive FIM Women's Trial World Championship with a 100% win record in 2016. The 25-year-old Brit opened the three-round season with a double victory in her home round at Tong, Yorkshire, a result she repeated at the second event in Italy. With each rider's final tally to be decided by their best four results, Bristow's 80-point haul from the opening two rounds secured the championship with a day of competition to spare. Whilst Becky Cook – TRS was second behind her British compatriot on both days at Tong, her third-place onthe opening day at Chiampo was chalked off due to a technical infringement, which combined with a second placed for impressive Spanish newcomer Sandra Gomez - Gas Gas, who led the opening lap, and a career-best finish of second on day two for Donna Fox – Sherco , the chase for the runner-up spot in the championship was wide open going into the final round at Isola 2000 in the southern French alps. In the end it went to Gomez, who bagged another second ahead of podium debutant Sarah Bauer-Sherco, as Bristow signed off with another win. Meanwhile, Cook claimed third overall after a tie-break with Spain’s Berta Abellan - Beta.